Located on the northern slopes of Mount Pion, near Ephesus, The Grotto of Seven Sleepers has been discovered by both Christians and Muslims with a growing interest. According to the Christian legend seven young men were walled in during the reign of Decius (250) and yet were seen alive in the streets of Ephesus during the reign of Theodosius II some years after the Council of Ephesus (431). In the Koran, it is claimed that the sleepers slept 309 years in their tombs. During excavations in the area, the church and several tombs have been discovered. Some inscriptions of the Seven Sleepers have been discovered on the walls of the church. This cave is located to the east of Mount Pion and is an important site to the world of Christianity. In the year 250AD seven Christian youths fled the city of Ephesus to avoid persecution and took refuge in this cave. They slept for two hundred years here. When they awoke after two hundred years they saw that Christianity was now the official religion. When the youths died it is believed they were buried in the same cave and a church was built at the site. It is thought that the Christians were in a dispute with the Roman state over the subject of an imperial cult where they refused to sacrifice animals at an imperial temple. The young men fled to a cave and after a while they fell asleep and when they woke up they went to city to buy food. To their amazement, they found out that they had slept not for one night but for two hundred years, and that Christianity had spread to every corner of the Roman Empire. When Emperor Theodosius II heard of the incident, he accepted it as evidence of resurrection which was being discussed in the churches at the time. 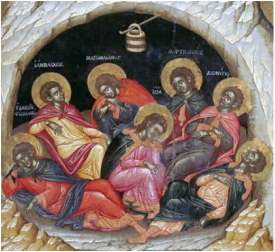 When these young men died, following an impressive funeral, they were buried in the cave on which a church was built later. The excavations carried on here during 1927-28 brought to light a church and several hundred graves which were dated to the 5th and 6th centuries. Inscriptions dedicated to the Seven Sleepers were found on the walls of the church and in the graves.